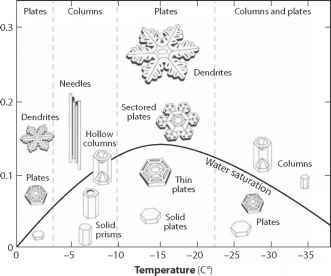 This chapter has provided an introduction to some of the main features of seasonal snow and ice on the land. Building on the thermodynamics of the cryosphere introduced in chapter 3, the equations for the growth of lake and river ice have been presented and applied in simple examples. These equations are also applicable to the growth and thickness of sea ice and permafrost, so we will continue to build from this in the coming chapters. The seasonal blanket of snow and ice unfurls over a large fraction of the world's land mass each autumn and retreats each spring, a cycle that affects weather, climate, ecology, and society. Seasonal snow is the most far-reaching but most ephemeral aspect of the global cryo-sphere. Its influence in midlatitudes gives it a powerful role in cryosphere-climate interactions. We return to this in chapter 8, and chapter 9 examines recent trends in terrestrial snow and ice cover.